U.D.S.R.R. Hosts HAM Radio Operator Event - Upper Delaware Council, Inc.
BEACH LAKE, PA – Imagine talking across town, around the world, or even into space in a time before internet or cell phones. As part of our celebration of National Park Week, Upper Delaware Scenic and Recreational River is partnering with the Wayne County Amateur Radio Club to educate people about the fascinating operation of HAM radios. Join us on April 23, 2016 between 9am and 5pm at the National Park Service Ranger Station in Milanville, Pennsylvania (1152 River Road, Milanville, PA) for a demonstration by amateur radio operators that brings together people, technology, and communication. HAM radio operation has been around since the early 20th century. The term HAM radio comes from phrases such as “ham-fisted”, or “ham-actor”, indicating that someone is clumsy or bad at something. Amateur radio operators adopted the moniker, and the rest is history! HAM radios can broadcast all over the world, and each operator or club has a special call sign to identify themselves to other operators. There is also a highly specific way of speaking on the radio when contact with another operator is made. Whether you are a seasoned HAM radio operator, or you are just curious to learn more about the hobby, this special event has something for you. The National Park Service Ranger Station in Milanville is located at 1152 River Road, Milanville, PA – please remember that the Skinner’s Falls Bridge across the Delaware River is currently closed. If coming to this event from New York the bridges closest to our Milanville office, with the easiest access to River Road, are in Narrowsburg, NY or Cochecton, NY. To learn more about the Wayne County Amateur Radio Club visit their webpage at https://waynecoarc.org/. For more information call (570) 685-4871, visit our website at www.nps.gov/upde, or follow us on Facebook at www.facebook.com/updeNPS. Caption: A young visitor learning how to operate a HAM radio. 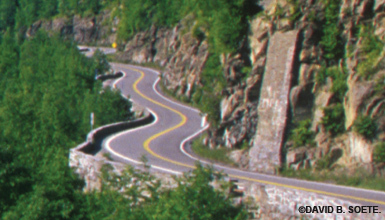 Hawk’s Nest Drive, located along the New York State Route 97 Upper Delaware Scenic Byway in the Town of Deerpark, is a favorite filming location for television commercials and movies thanks to its exciting S-curves between a natural rock face and man-made rock walls and majestic views of the Delaware River some 200 feet below from a series of motorist pull-off areas.